Wednesday afternoon, Amanda and I dropped off our kids with my sister so that she could see me off at the airport. It was hard to say goodbye, but they didn’t realize I was leaving for two weeks and didn’t seem upset at all. That made things easier, and I know they had fun playing with cousins. We got to SFO and said our goodbyes. All the parents of all the students were there, looking a bit anxious for their kids. It was great to see all the families supporting their students. After we checked luggage, we said goodbye to families and headed through security. 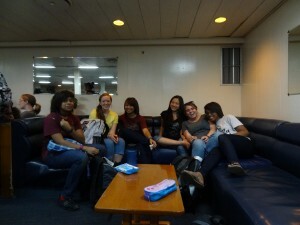 After a short 1 hour flight to LAX, and a few hours of waiting, we boarded our plane to Fiji. Somewhere along the way, we got some bad intel on the traveling. We were expecting an 18 hour flight, and it really only took 10-11. It’s always nice when you plan for the worst, and you receive the best. That was our airplane experience. 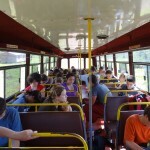 As we left the airport, everyone loaded luggage and students onto our first bus. 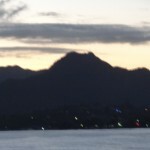 We headed from the airport in Nadi to Suva. The drive on the bus to ok about 4-5 hours, with 2.5 stops. 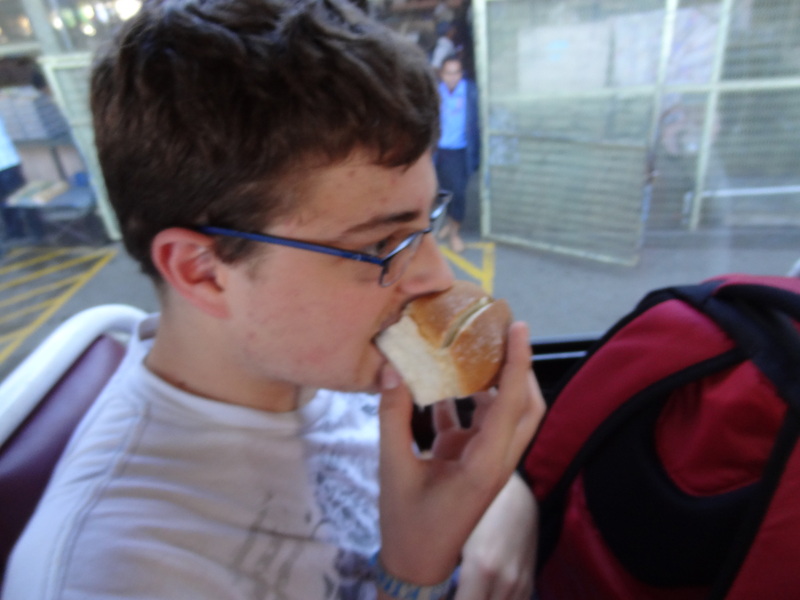 The first stop was a bathroom break, and breakfast stop where we had some amazing rolls with sweet cream filling. I could eat those everyday. 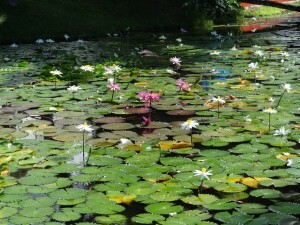 The second stop was another bathroom break, and we saw a pond with some amazing flowers and lily pads. 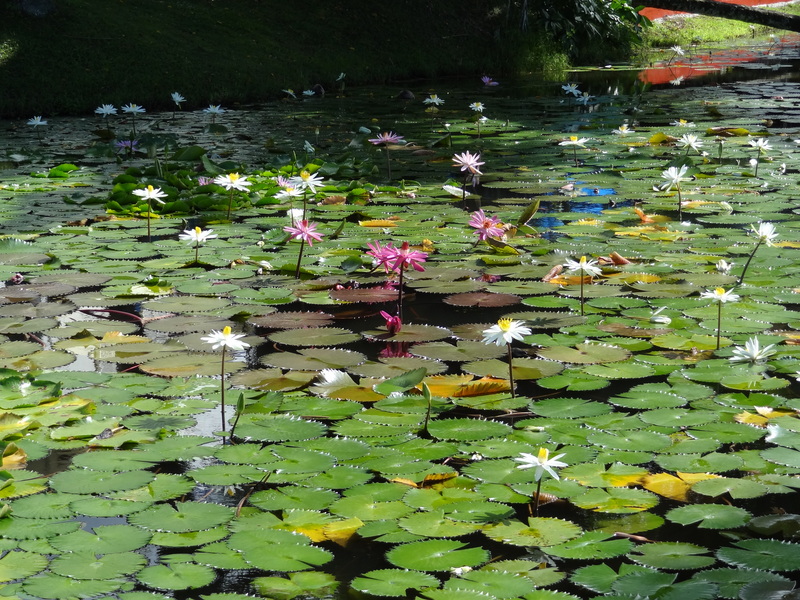 There was a sign posted noting that picking the lily pads was a crime. The final stop we made only counts as a half stop, but it was by the Sr. Fiji police, who may or may not have caught our bus speeding. 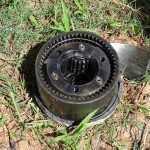 It was difficult to know exactly what was going on, because the exchange was not in English. 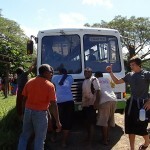 Either way, nobody was arrested and we finally completed the first bus ride and arrived in Suva. 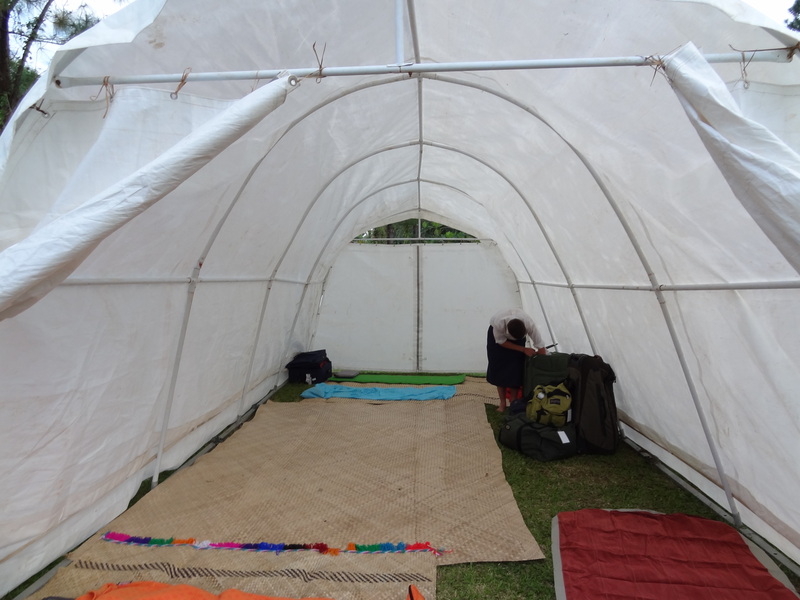 Suva was our first experience with getting taken by the vendors. 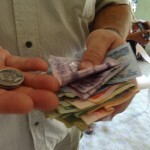 Students were dropped off, and told to buy sulu’s. We were told that they should be had for about $11. 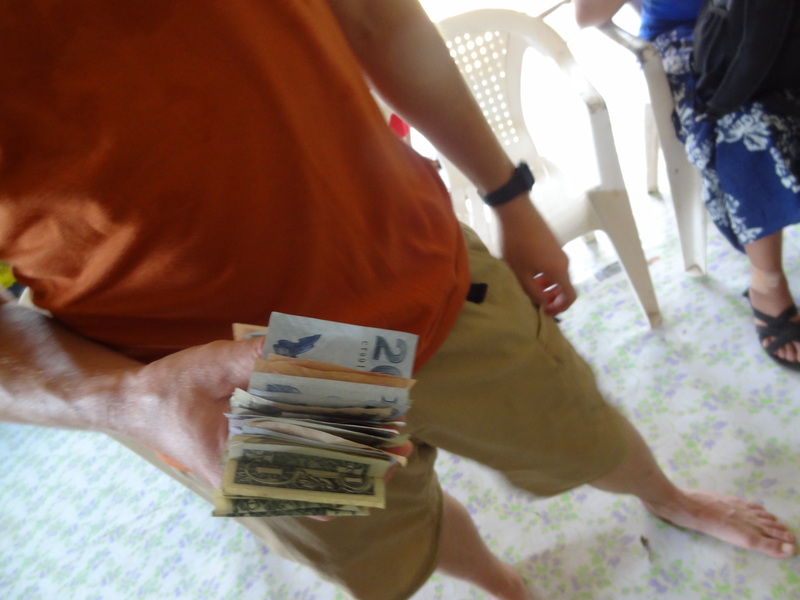 After we exchanged our monies, we were set free upon the market area. No guy came back with a sulu purchased for $11. A group of us did score some for $13; many paid $15. My dress sulu, with pinstripes was had for $20, down from $35, so I felt pretty good with my bargaining skills that day. We then went back to a local restaurant for our first Fijian dinner, it was a place called McDonalds. The food was decent, and it was funny to see students who ordered ice cream, because the milk products aren’t fermented like they are here in the states. I had one bite of an ice cream and gave the rest away. It wasn’t for me. 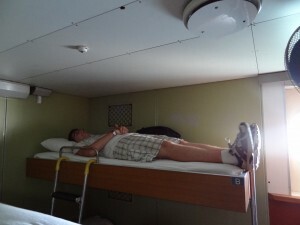 Andrew enjoying a nice bunk bed. Perfect size! hanging out together, meeting some locals also aboard the ship, and getting a nice night of sleep in a bed. 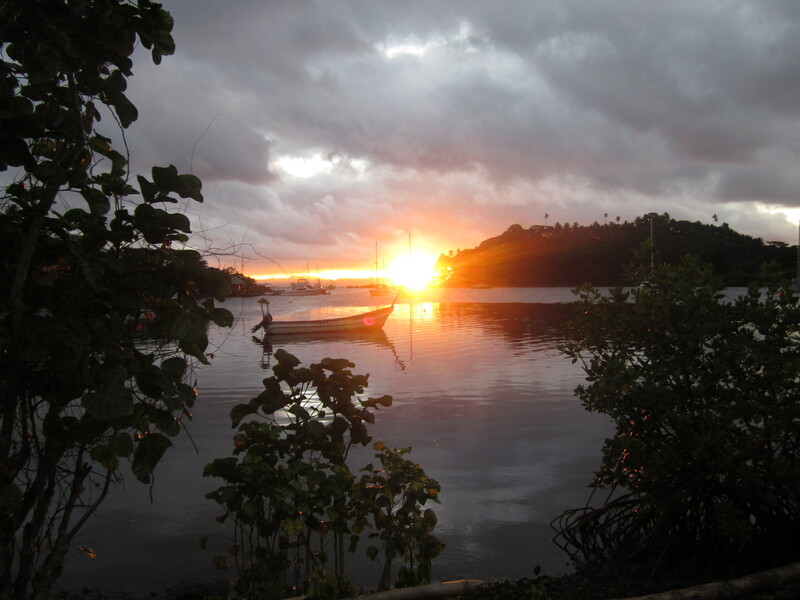 We had to wake up early though, and the ship arrived in Savusavu around 6am. After receiving some team instructions, and getting the itinerary for the day we were ready to get off the boat and get to work with a full day of organizing medical supplies. We walked from the boat dock about 5 minutes up the road to the Hot Springs Hotel. A nice little resort, with a great view. We unloaded all the luggage, sorted out all the medical bags, had students unload all the supplies they carried in, and we got to work. 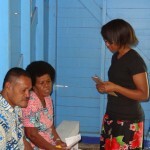 le being trained on how to do the medical clinic stations. We were all broken up into 3 groups for training. The intake station practiced taking blood pressures, and learned how people would be checked into the clinic. 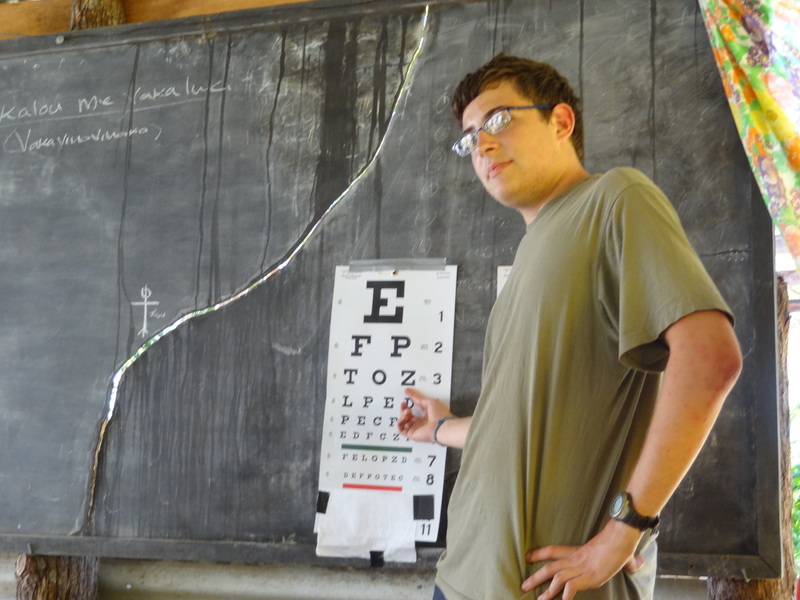 The optical station learned about the different lenses, what people would need what glasses, and how to administer a vision exam. Finally, the pharmacy group learned how to decipher doctor shorthand, and a little about prescriptions. 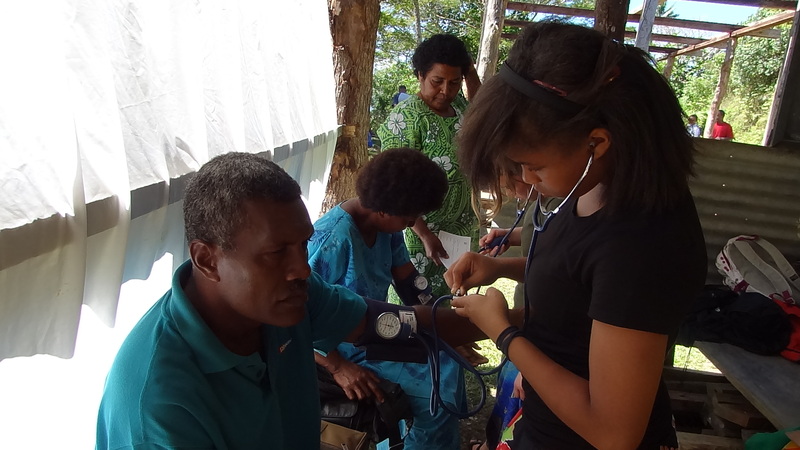 After all the clinic trainings, we received some general Fiji trainings, then headed up to the church we would be staying at that night to practice kids dramas. After that practice, we headed down to the park to eat some delicious pizza, and watch an amazing sunset. 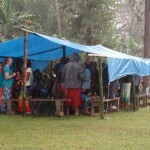 After we went back to the church, girls were sorting out taking showers. Rotating through 2-3 minute showers in cold water didn’t seem appealing to the boys, so we grabbed one of the local interns, and headed down to the ocean for a nice refreshing swim bath. Students were climbing, swinging from, and doing flips out of trees into the water in the dark. It was a great time of fun and refreshing for us. because of an intense need to pee. The worst part of it all was I had no clue where the bathroom was. IMPORTANT MISSIONS LESSON: Always know where the bathroom is wherever you are… At this point, being in another country, at a church, I felt like going in the bushes outside could be considered quite an offense. So I paced, and I walked, and I tried to sit, and I paced back and forth some more. I prayed intensely during that time, not for ministry later that day, but that someone who knew something about where the bathroom was would wake up. Andrew was no help when I woke him up to ask, a few girls were up, and moving around, but I didn’t want to go over to their church side (Later on I found out they had the same issue 🙂 Finally, after an hour of sweating and pacing back and forth in the church, someone showed up around 5am to start breakfast. They escorted me to the toilet, after showing me the showers when I asked for a bathroom. WHEW! Lesson learned. Other, more relevant things happened Sunday and I guess I can share that stuff too. Our team would be speaking at the English AOG church up the hill, so the team ate a great breakfast and had some time to kill. Students hung out at the back of the church we were at and spent time playing with little kids, doing games, songs, and bible stories. 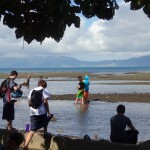 The kids were all so happy (both AMerican and Fijian). About 10am, 5 hours after I’d been able to pee, we headed up the hill to go to our church. It was a warm morning, and humid, and I am thankful I chose to wear an undershirt. Needless to say it wouldn’t be the first day that pit stains were viewable, just not on me. The worship at the church was great. 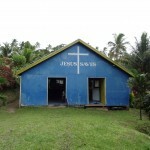 I loved the voices of the Fijian people, and they really go deep in worship. A lot of the songs were older hymns that went from English to Fijian and they sounded amazing. There were also a few 90’s worship hits thrown in there as well. I was extremely proud of our students after the service. I thought the message was pretty good, but the drama and student testimony were great. I especially enjoyed that while preaching some guy in the back was shouting out “Amen” and “Praise the Lord” and other good encouraging things. I like a little in-sermon feedback. We ended the service with students praying for people, and I found the time to be powerful. There is nothing like watching a team of young people ministering to and praying for others. It wouldn’t be the first time I’d watch our students during ministry and have to hold back joyful tears. We know we did a decent job at the church, because afterwards we were invited back for some juice with the Talatala (pastor) and his radini (pastor’s wife). students may have different opinions, but it was the best juice I have ever had in the history of my life. It had some pureed fruit in it, and I took my time slowly drinking it down (I took my time because in Fiji when you run out of something there is always a Fijian woman right there to give you a refill, and you have to eat and drink whatever is put in front of you, and I was already not especially hungry). If I remember right, Lily had 3 glasses of juice and it wasn’t her favorite drink. 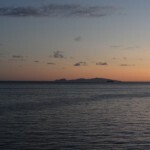 ip would be the gracious self sacrifice and hospitality of the Fijian people. As we arrived, unpacked luggage, and trekked through the woods to get to the church and carport house, we finally arrived. 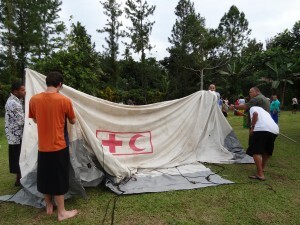 Students immediately started playing soccer, and a bunch of us adults worked on putting up a Red Cross tent that had been donated but the Fijians did not know how to put it up. We really didn’t know how either, but somehow, eventually, the tent was raised and another shelter was built for guys to sleep in. us that cooking for 40 Americans was like cooking for 10 Fijians; they “Eat Big”. Sunday night we had a welcome service, our preacher got bumped for a missionary from New Zealand. The church was so packed that many of us sat outside and looked through the windows for church. 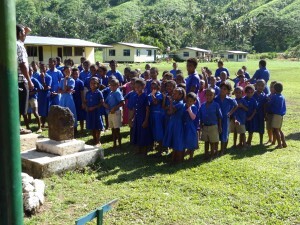 The Fijian interns that were with us did a powerful action song that our students loved. Both times we saw it I teared up and got goosebumps. It was good. 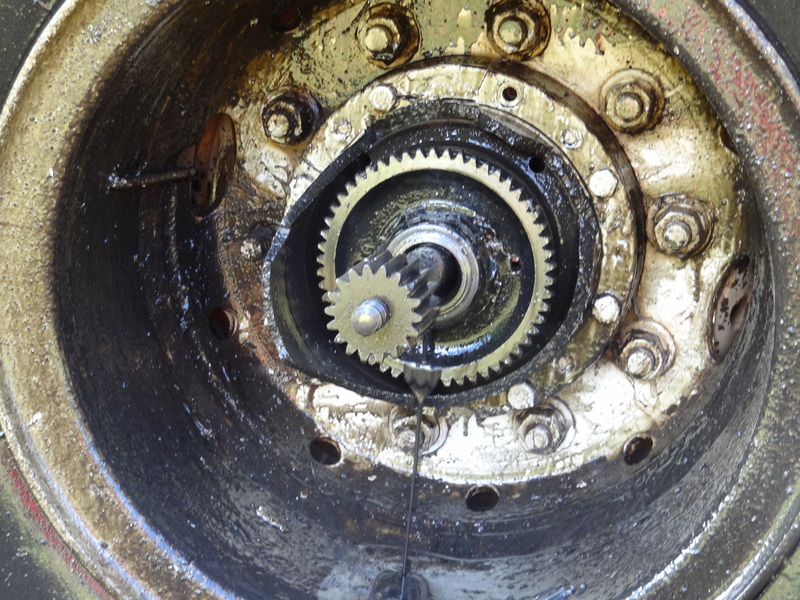 o bad, but I’m sure it made it nice and clean. After that, we ate some breakfast (white bread, fresh rolls, fruit), and headed out to the main area of the village for our first clinic. Our first clinic day was pretty exciting and fun. Once we were set up, we saw about 175 people that day. I spent the entire day in the pharmacy, and also headed up the organization of the outtake. Outtake was a made up job to keep me busy organizing patients intake forms numerically, and keeping tabs on how many people we had seen each day. It worked out well because I was pretty neurotic about keeping it orderly; and it gave a few of the Global Passion leaders a nice chuckle at my expense. During this first day of clinic, students also went and did a school assembly, and put together a kids program for vacation bible school. The Headmaster of the school told our group that it was their highlight of the entire year. At this school, Tirzah was able to share her testimony to the kids. Amy and Carrie shared as well. After the school assemblies, VBS (Vacation Bible School) and the clinic were all through, we headed back for dinner. After dinner, the boys headed back down for another bath in the river. This time I bathed, and it was incredibly refreshing. There is nothing like cool running water when you have been hot, sticky and sweaty all day long. It was probably the nicest feeling bath I’ve ever taken. Tuesday was probably the most memorable day of the entire trip. A lot of things happened this day. Breakfast in the rain; it's thick! 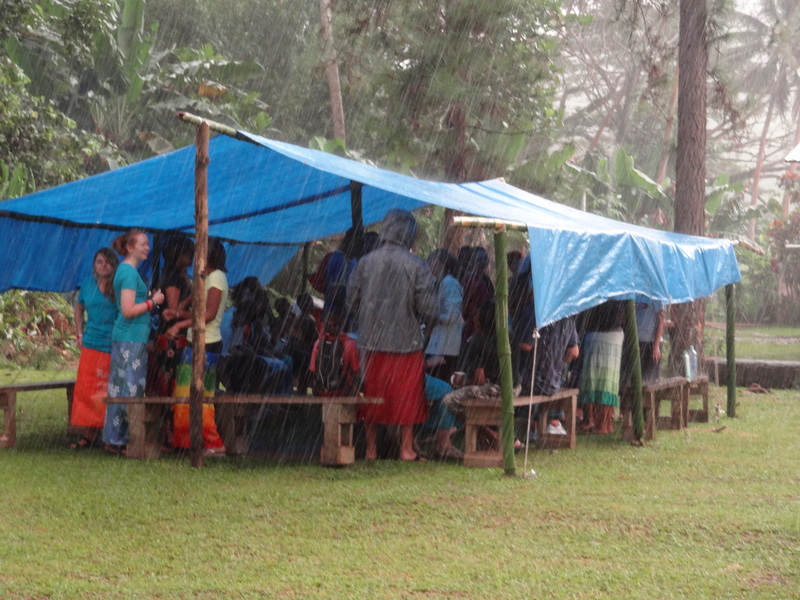 First, it was the first day where the rain poured on us; for all of about 30 minutes. It was so heavy, people were under cover and still getting wet. 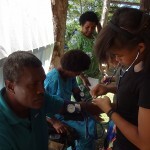 After it cleared and breakfast was over, we headed out to the village to set up for the clinic that day. For this entire day, we would spend no time with the clinic. After set up, we were taken across the street to a church and one of the local interns trained the student ministry teams on door to door evangelism. This was probably the scariest feeling I had so far in Fiji. One, we were breaking off into three teams, and my students would be scattered around. We trained hard, but all it takes is one stupid action for a trip to be ruined. 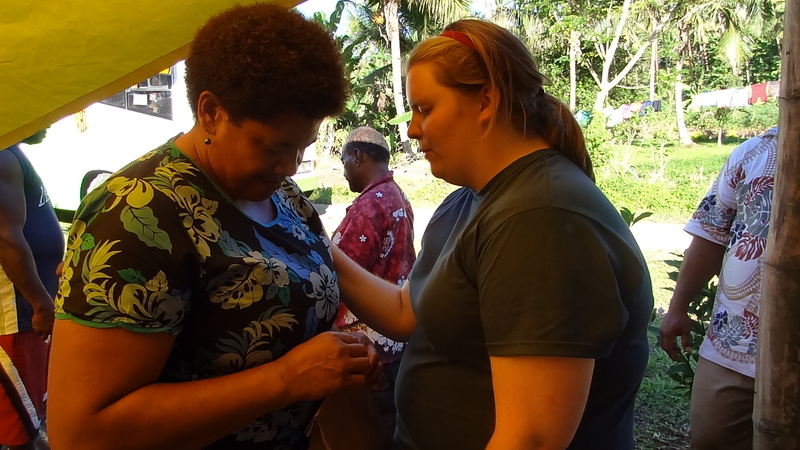 Two, there were some Fijian customs we had to remember and do when entering people’s houses. Taking off shoes, not sitting in front of doorways, saying “Chulo” a million times when you enter until you sit down. Nothing too scary, but we didn’t want to forget something and be offensive. Fortunately, door to door went amazingly well. 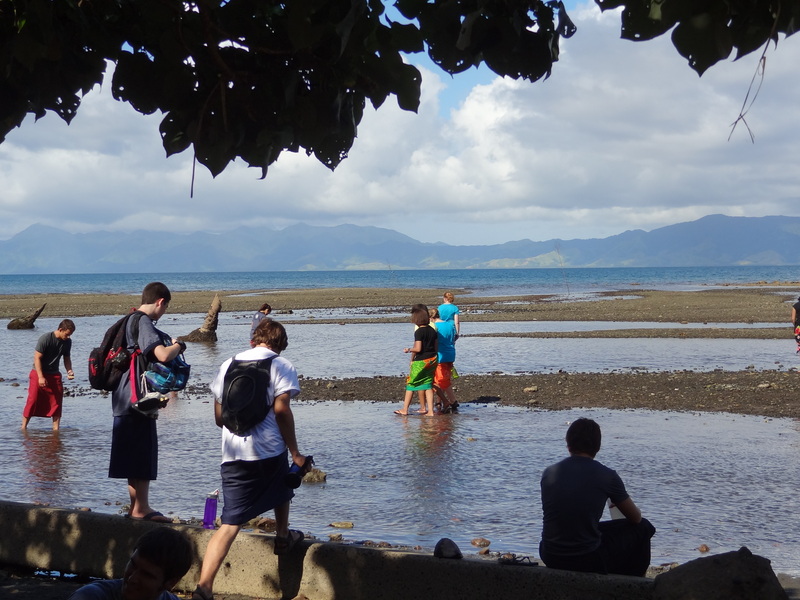 Students had great experiences, meeting people was amazing, and it really opened up our eyes to Fijian culture. Every single house we went to opened their doors to us, invited us in to talk, and were so friendly. We met mothers with small kids, entire families with 3 or more generations living under one roof, and lots of interesting people. 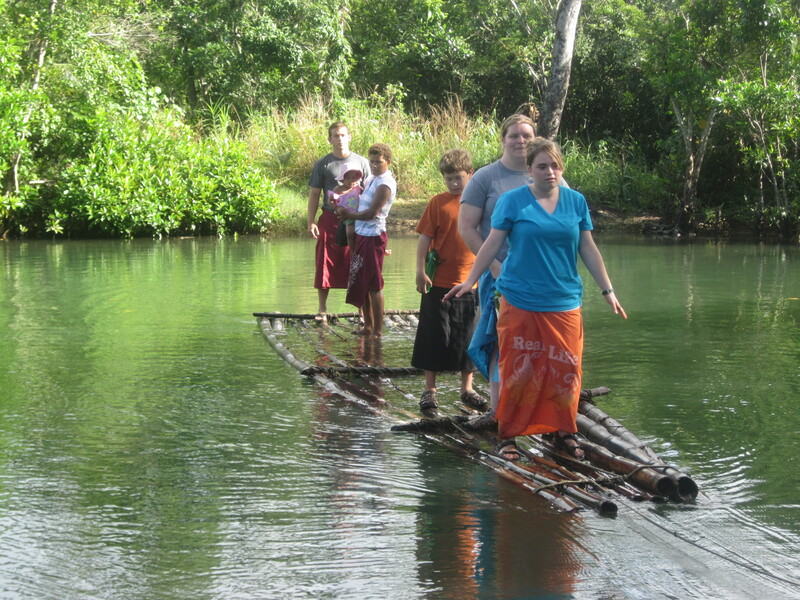 A group with a few of our students went with Sau (our Fijian super pastor) and traveled over the river and through the woods. They encountered a woman who had been paralyzed for 6 years and couldn’t make it to the clinic because she couldn’t walk. When we came back together to debrief, all the students who had gone to that house came back crying. It was a life changing event for those kids; to meet with and pray for someone who couldn’t walk. I was in awe of the impact it had on them. Door to door was one of my favorite parts of ministry in Fiji. It seemed like every house we went into was a family with small kids. I was able to share a little of my story, about Chloe being sick and needing heart surgery,and about how God carried us through that difficult time. 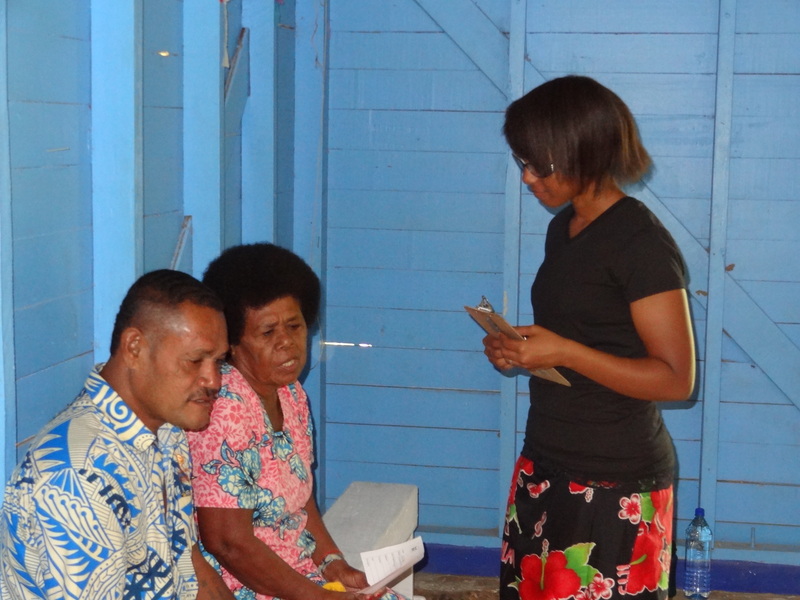 I really felt like I endured those trials in my life, so that I could encourage some families in Fiji. One of the houses we stayed at longer than the rest. The family had like 10 kids, and their oldest also had special needs. It was great being able to connect with them, tear up together, and pray for their family. Their daughter was away at a handicap school, but looking into the father’s face made me think back on all God had done for us. Encouraging them, hearing their stories, sharing my stories, was a highlight of the trip for me. I’ll never forget that Dad’s face, and I’ve continued to pray for that family. 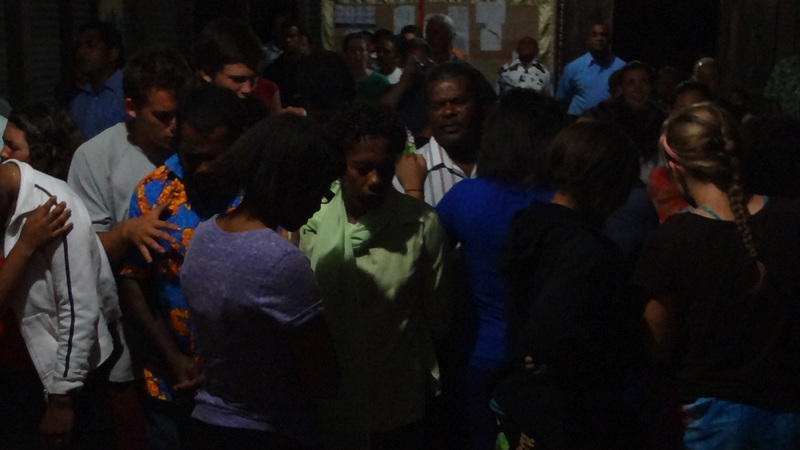 After door to door visits ended, we spent time talking to people waiting to get into the clinic. I spoke to a caretaker of the school we would be heading out to that afternoon for an assembly, who also farmed kava. He was an interesting guy. 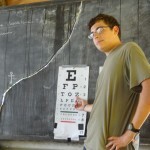 The fellow next to him had just come from the clinic, was wearing his new glasses, and shook my hand and said “Thank you doctor” as he headed home. Even though I hadn’t done anything, I felt honored. Yeah, we’re still only to about 11:30 Tuesday, and Tuesdays never seemed to end on this trip. 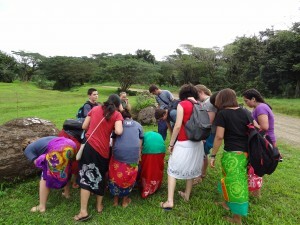 After door to door, we rounded up students and everyone headed off to do another school. I was scheduled to speak at this one, and had a sweet little devotional about when Jesus fed the 5,000. But that would be a message that nobody would hear on this trip. 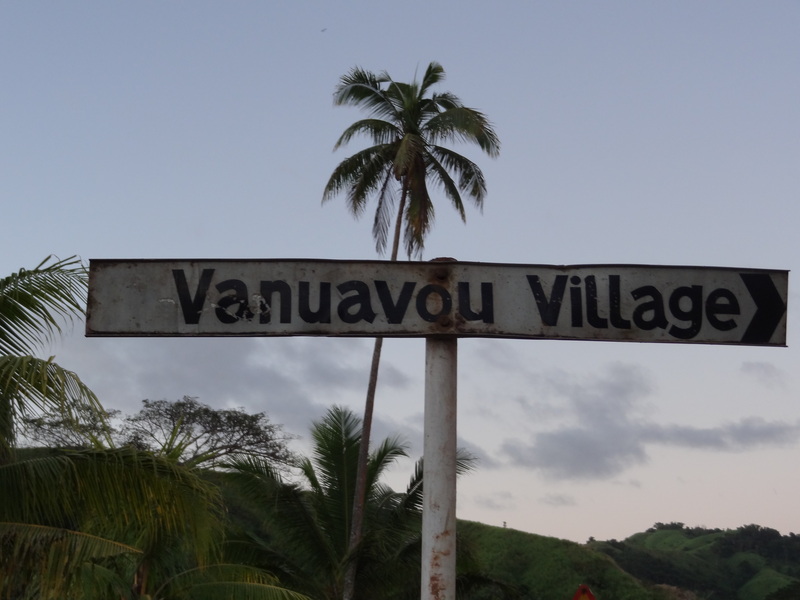 The school was about 45 minutes away from Vanuavou where the clinic was. 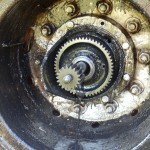 After about 40 minutes, our bus broke. I don’t mean it just stopped, or died, I mean pieces were falling off, children screaming, and probably somewhere there were flames pouring from the bus. Everyone managed to survive, barely. I had the wonderful privilege of breaking the good news to the students that the bus was unrepairable (which I volunteered to deliver). The other two leaders and I decided we would have the kids walk back, so I hopped on the bus to deliver the news. As I got on, it was silent except for praying voices. It was exciting to hear students calling out to God to heal the bus; but God said, “No”. After we unloaded our gear, a nice group of people invited our team under their overhang in the shade. It looked like we could just sit here in the shade, hang out, and wait for the next bus. Again, after everyone had sat down and relaxed, I volunteered to break the news we were still walking. 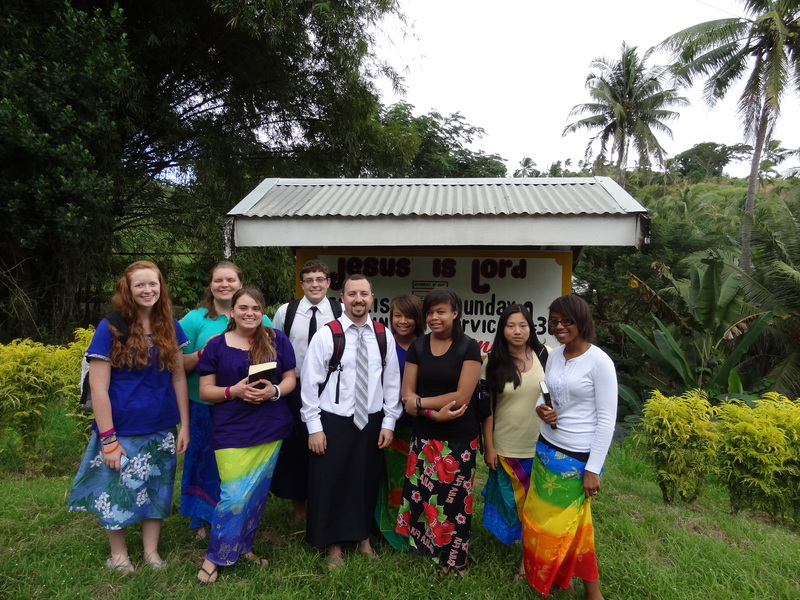 We thanked our gracious hosts, and headed out into the Fijian wilderness. We walked forever. 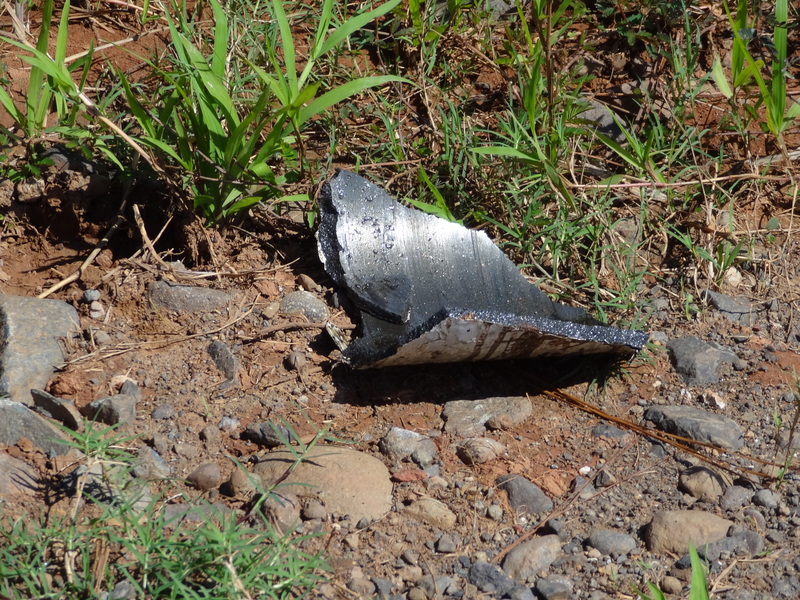 Everything in Fiji is apparently uphill. It was hot. It was humid. It rained. We were hungry (we ate no lunch that day). We were thirsty (people only had their small water bottles). People walked too slow, or too fast. We only had flip flops, or bare feet. Sandals were breaking. Blisters were breaking out on people’s feet. It was tiring, legs cramped up. These are all the things we faced through the entire walk, and not once did students complain about it. They put on smiles (many of them forced) and walked. We walked on rocky dirty roads for over three and a half hours. Other than one prolonged break, we rarely stopped. Kids sang, kids smiled, kids gotto know one another. 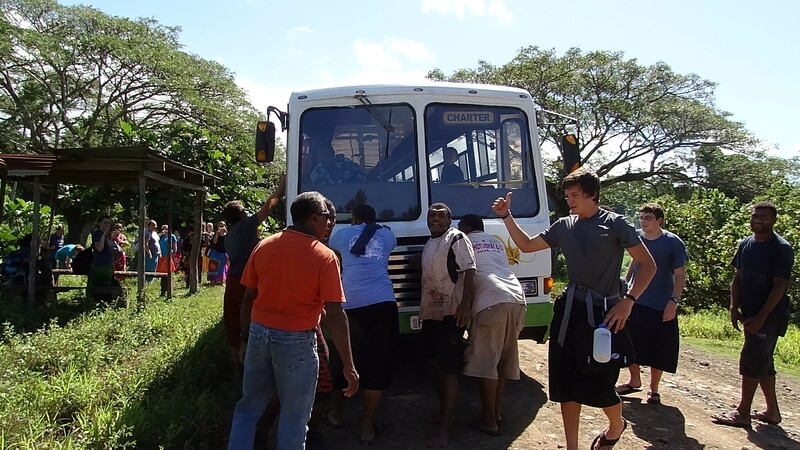 The bus breaking down and students walking through Fiji was the best team building event we could have planned (but didn’t). Students were encouraged along the way by chanting their attitude check, “Oh, I feel good, I feel so good, Oh double oh oh!” or something like that. We also kept telling them we were about half way back, until we got to the actual half way back 3 hours later. In total, that 3.5 hours we covered around 7 miles. It was amazing. What was more amazing was that when we finally got back to the village, exhausted to the max, the students immediately started VBS and played and performed for the kids. Even being tired, they gave their best to those kids. It was a remarkable display of perseverance, for kids who sit home in the US and complain about everything, and are generally lazy. It was a God moment. Still Tuesday, after the clinic and VBS ended we went back for our farewell feast. A pig had been slaughtered and cooked underground in the Luovo for us. We ate like Kings. The pastor gave a heartfelt speech before we ate, and I really felt honored to have been at the village. He apologized if we had to eat food we didn’t like, for us sleeping on the ground, and it was humbling. Our leader summed up the groups thoughts when he said no apology was needed, and that we were blessed to have been treated so royally. The feast was great, and the pig was delicious. 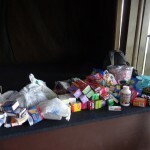 After the feast, we loaded up on a bus and headed for Nabua, the luggage would follow us later in a truck. 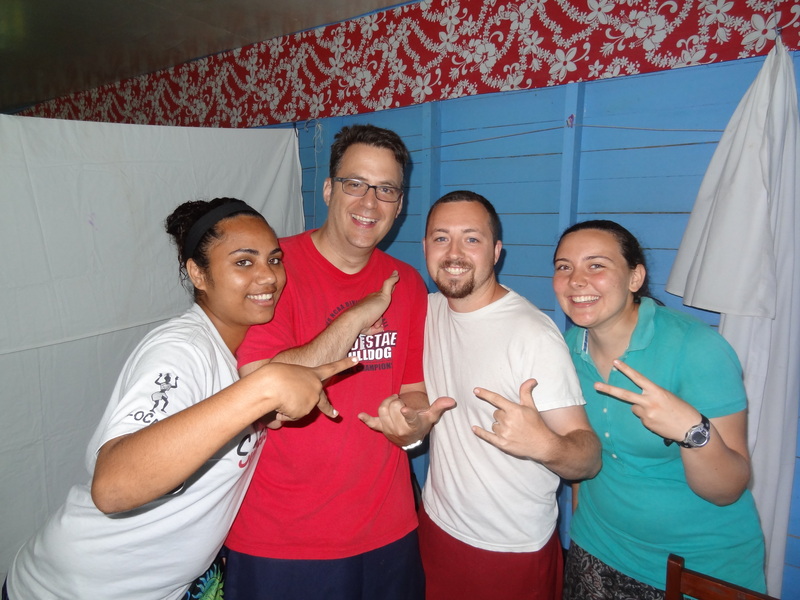 After arriving in Nabua after a really long day of ministry and walking, we had a long night ahead. I was able to meet the pastor of the next church we did the clinic in. He had ripped all the boards for his house and the church with a chainsaw, he had cut into the hillside for the church, and it was humbling. 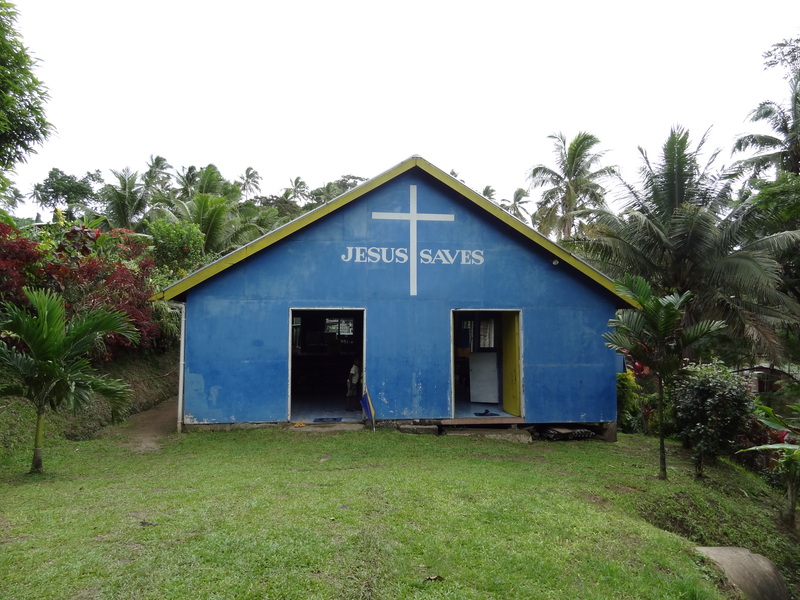 The Fijians were hard workers, and this pastor showed it. We spent two nights in this village. 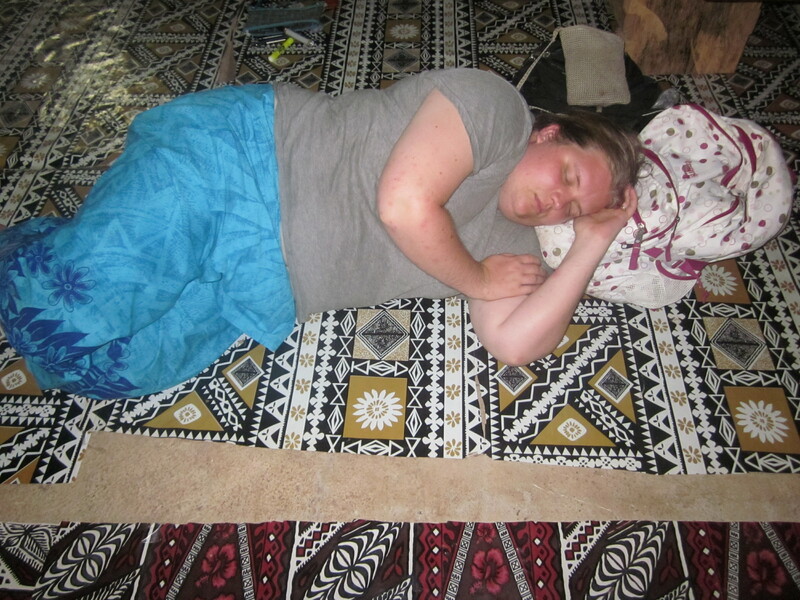 After our debrief, we waited for the luggage to arrive so people could sleep… it would never arrive that day. We waited, and waited, and waited. 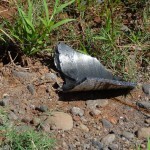 The actual details are a bit fuzzy, but a truck broke down, a bus never showed up, and another bus never showed up. People passed out on the concrete floors they were so tired. In another display of Fijian awesomeness, the people from the house brought all their own pillows and blankets up to the church where people were sleeping and covered them. They gave up all their own comfort items because our stuff had not come. It was humbling. At some point, a truck or bus with luggage came. I was passed out on a bench outside, and remember someone hitting me to get up and get my luggage. About 30 minutes later I got up, got my things, and went back to sleep. Sleep was a more precious commodity than gold to me that day. Thank God for ear plugs. The second half of the day was spent in the clinic, and students also spent time talking to people outside the clinic waiting their turn. A pretty standard afternoon, without much events. Later that night, we had a church service. It. was. amazing. 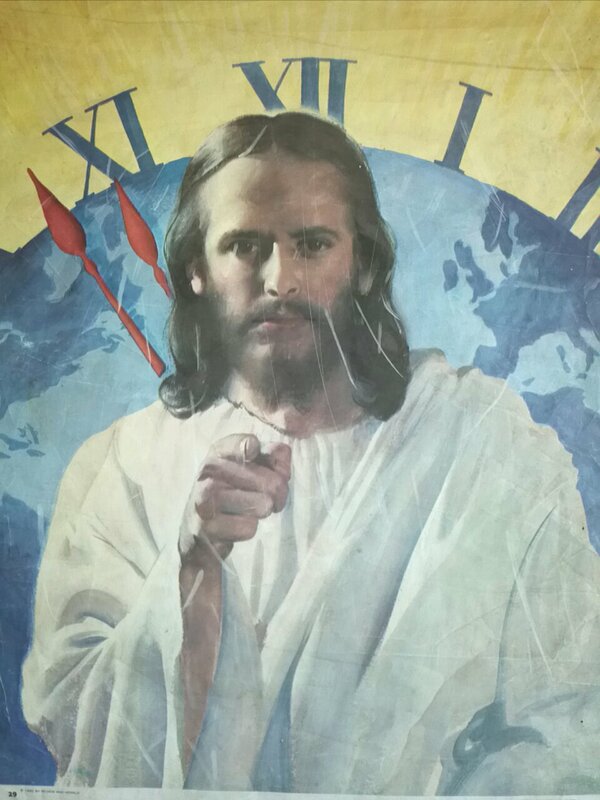 The message was spot on, the altar time was great. Some of our students prayed with people to accept Jesus for the very first time, and it was their first time praying with someone for that. 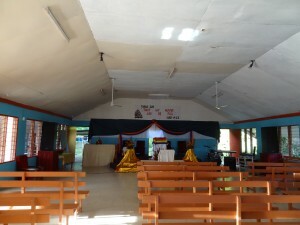 The pastor shared that this was the first time a team had ever come to this church. Again, humbled. I was stuck doing video during the altar time, but quickly ditched the camera to pray for a man and his son. Powerful stuff went on, and people lingered around the service for quite a bit of time. After, I went off by myself and wrote down a bunch of great things God had spoken to me, then spent some time talking to the missionary who was in Fiji. 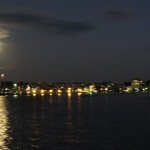 I left that night feeling encouraged. 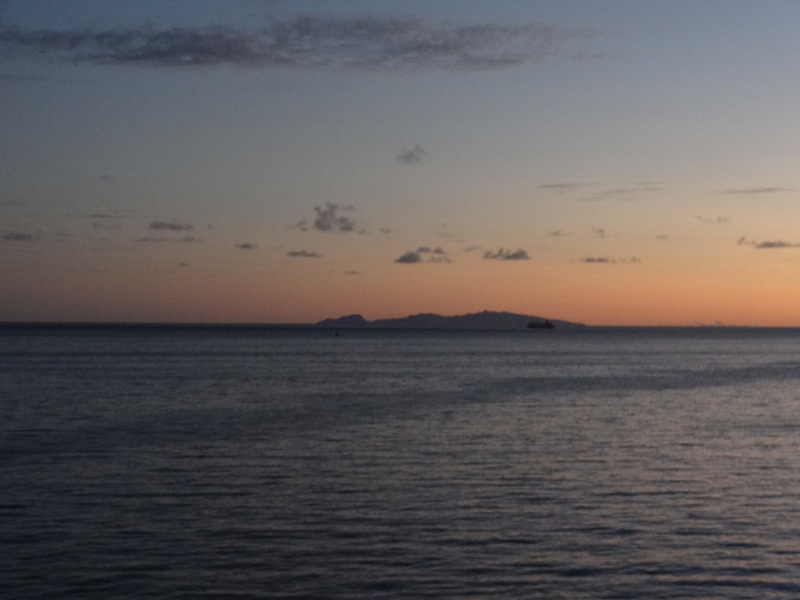 The weather in Fiji was beautiful, but Wednesday night sucked. It had been dry every night so I went to sleep under the stars. It was beautiful. I did not pack anything warm, and just had a silk cocoon sheet for warmth. It did not provide that. During that night, I woke up soaked from dew, I wrapped my sulu around me like a blanket for warmth. It didn’t help. I woke up that morning teeth chattering, and chilled to the bone. 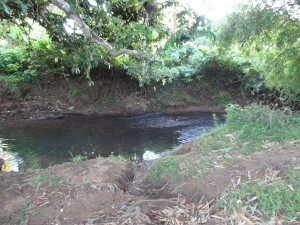 No river bath for me that morning. The river baths were quite nice when it was hot, but in the cold mornings they weren’t that great. The bathrooms in the villages were at times a little different from home. 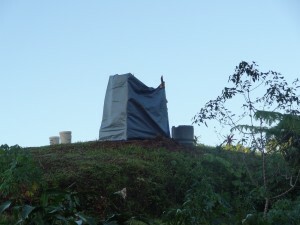 A few were 4 posts, wrapped with a tarp, a hole in the ground, with a toilet bowl over it. Flushing was pouring a bucket of water into the bowl. Thursday was another clinic day. It was all outdoor, but a real smooth day. The clinics overall were a lot of fun. Talking to people, seeing their excitement over getting tylenol, or vitamins was a real wake up to how spoiled we are here in the US. We never ran out of medicine that people needed. On this day, in the outdoor village, we couldn’t drink the water. It was the only place we were at that was the case. We gave every person in this village vermox which killed worms. At the end of the day, there were 3 bags left. We never used any again. It was great to see that the supply was always right on. Friday was our final day of clinics. We did a half day clinic at a nice village, in a nice facility. I was able to go out on a home visit with the nurse and it was a neat experience. The woman and man were pretty old, and had lived there for a long time. They had lots of kids, and hearing their story (through an interpreter) was a great experience. After clinics ended, we shut down, packed up, and I separated the leftover meds and supplies into goodie bags. One bag would go to Pastor Napoleani who had trveled with us the entire time, one for Bethany AoG which housed us and fed us a ton, one for the Rescue Mission, and one for Pastor Bill. 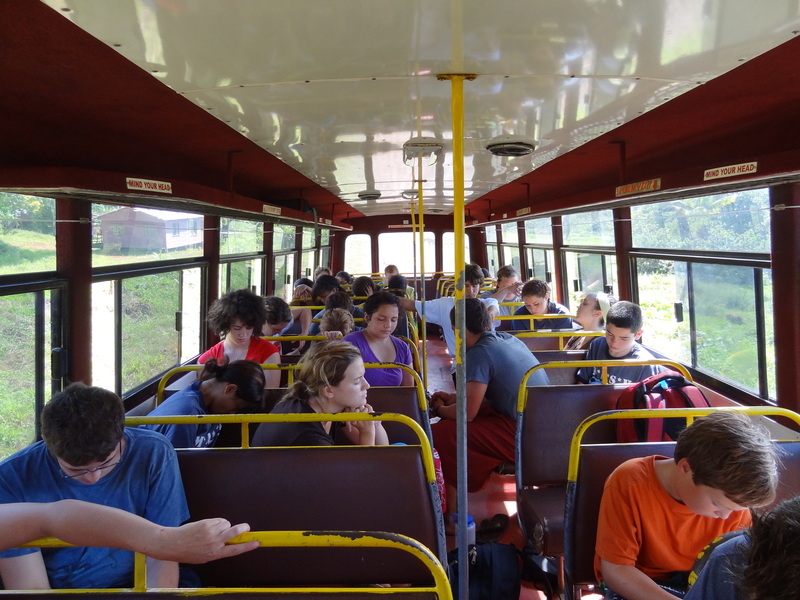 We loaded the bus, and had a long ride into Nabawalu. This was the most treacherous bus ride we experienced. Up and down hills, over bumps, people puking, people having to go to the bathroom in the woods, stops for snacks, and another bus breakdown. 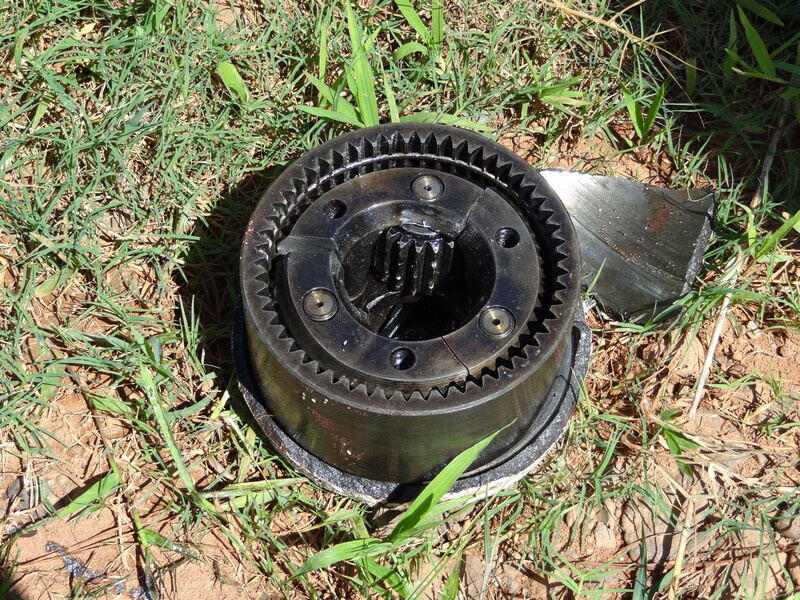 It broke a leaf spring, so to make sure the other didn’t break and we could keep driving, we drove extra slow. 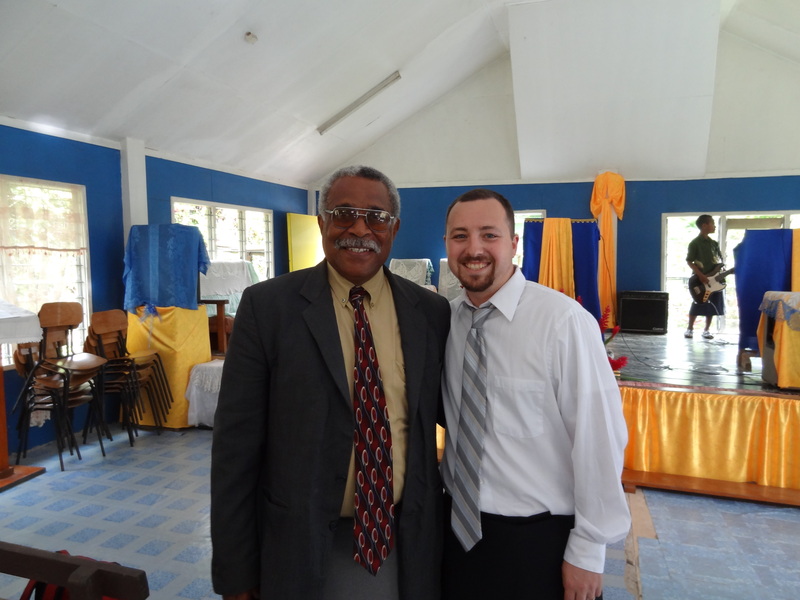 The time wasn’t so bad though, as I had the chance to continue hanging out with another pastor on the trip. All in all, the ride took about 6 hours. We arrived, unloaded the bus, ate quickly, and headed into the nicest house I saw in the villages for the boys to stay in. We stayed in a man named Tui’s house, and it was sweet. Nice hardwood floors, a refrigerator, indoor showers and toilet, and BEDS!!!!! This was my first bed in Fiji since the overnight ferry ride, and it was nice. I slept so good. 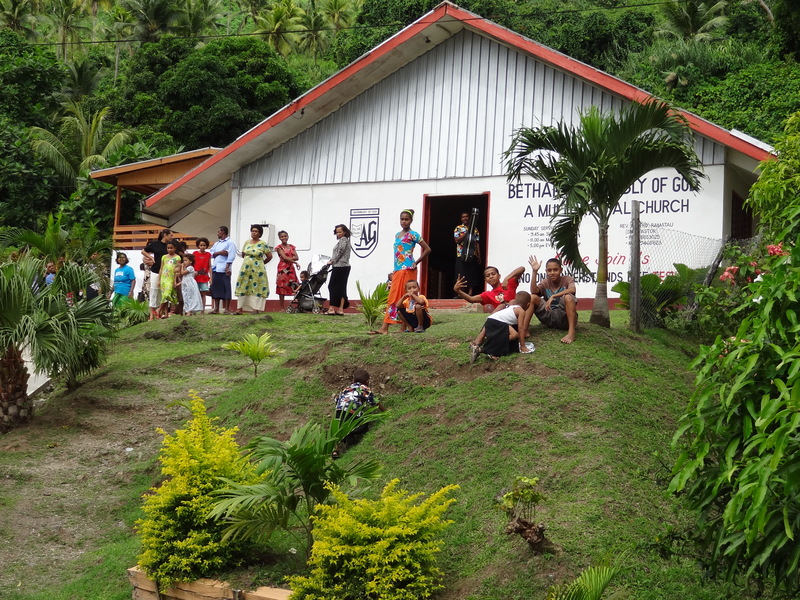 Miracle Church: Pastor Bill felt God call him to come to this village, and so he went. He left his family to go and start a church. It was over 2 years he was away from them. When he arrived in the village, the people there did not want him, did not want his church, and tried to chase him away. 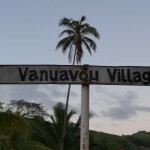 WHen he got to the village and they wanted to send him away, he wound up staying with Tui. Tui happened to be married to the chief’s daughter, and so through that connection the chief let him stay in the village. But they still did not want his church, and sent him letters letting him know he would never be able to purchase property in the village. Then one day, an Indian man got very sick and they called pastor Bill to come and pray for him. On the spot, God healed the man. The next Sunday the Indian man came to the church service, gave his life to God, and got baptized. 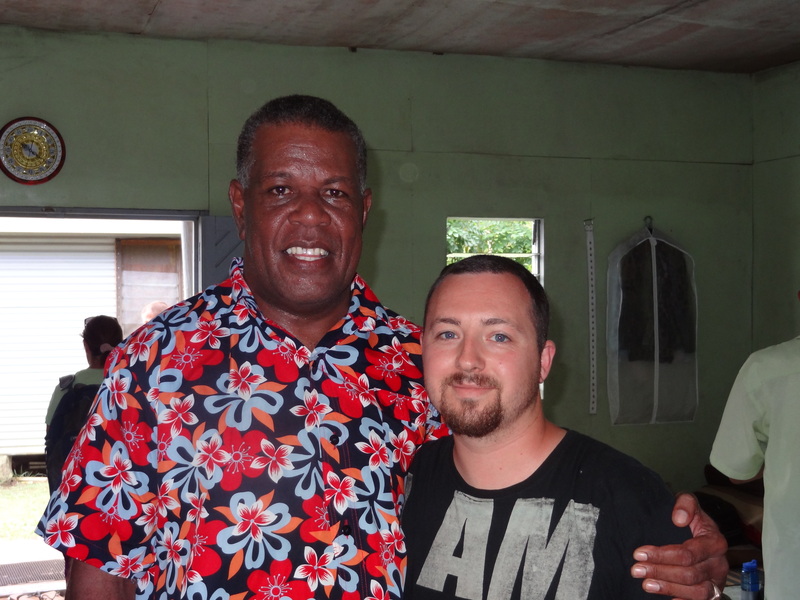 The next day, the man called pastor Bill, and donated property to him to build his church on. The property is close to the port, and a launching point for the entire island. 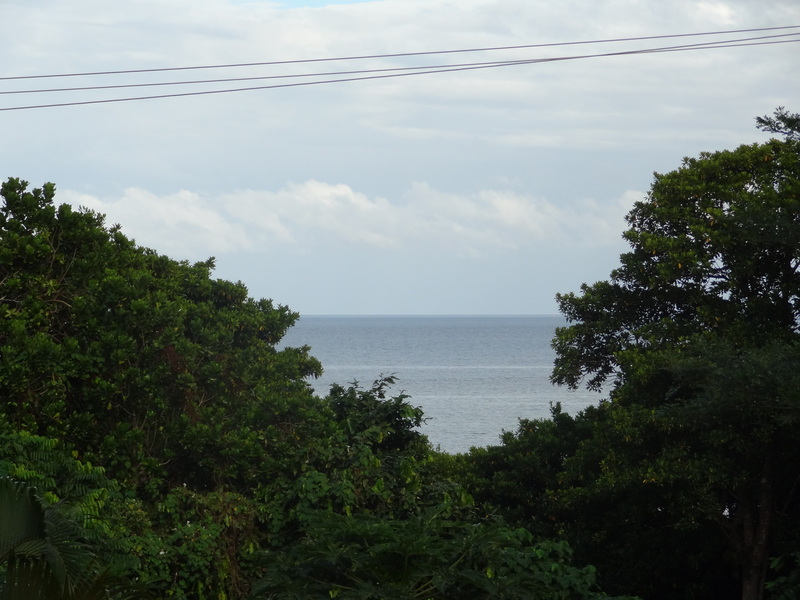 It’s also ocean view land and worth over a million bucks. 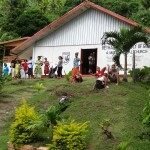 Some time later, a Canadian group donated money and labor to build the church building, over $10,000.00 and labor. People from around started donating pieces of wood and sheets of metal to build a house for the pastor as well. It was miracle after miracle. Amazing story of God’s blessing. But the miracles there weren’t just history. First, we ate some miraculous fried rice for breakfast, probably the tastiest thing I ate in Fiji. I ate a ton of it. 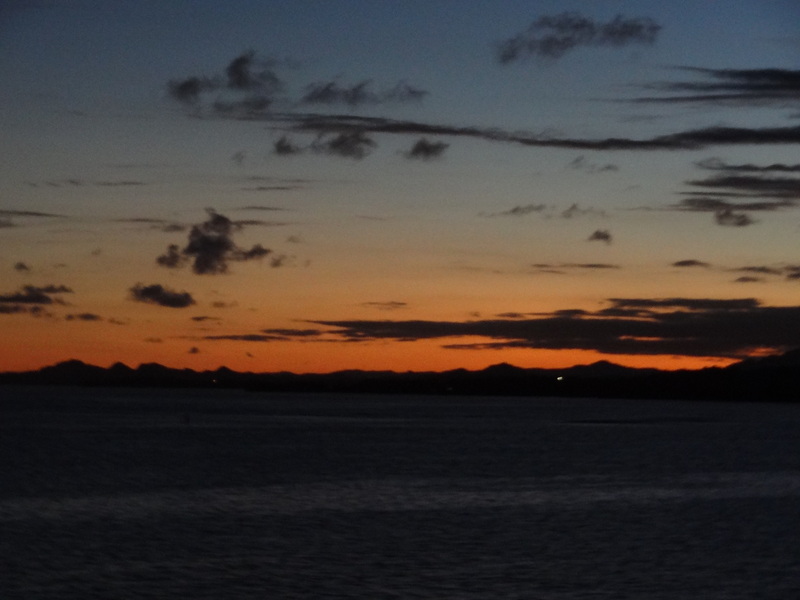 But before we left for the day ferry to go back to Suva, we also had a spur of the moment offering. A pastor from a previous village was going to be leaving to plant a church somewhere else, and he wanted to build a house for the new pastor that would be coming. Also, Miracle Church was going to be taking a missions trip to Vanuatu and we wanted to help with their trip. So on the spot, with no foreknowledge or preparation, we took a small impromptu offering. We expected or even hoped to get a few hundred to help out. But we didn’t. 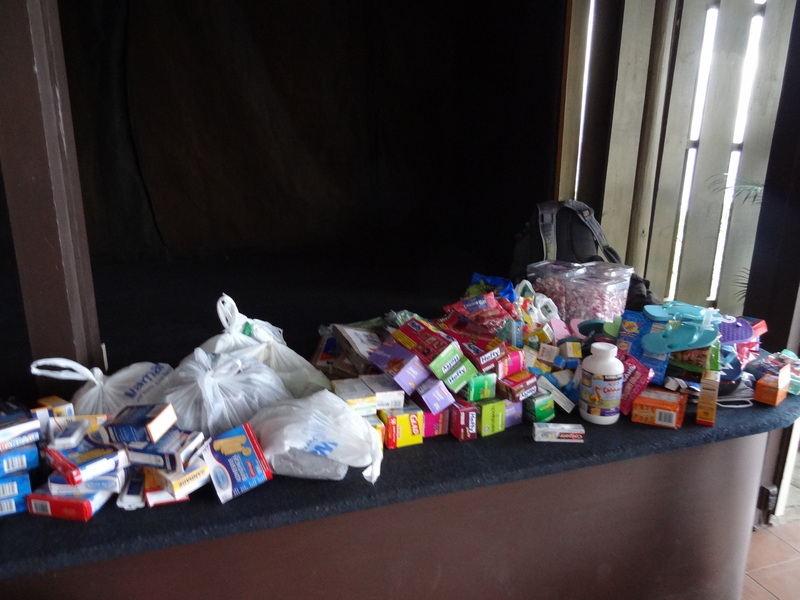 Instead, the students gave over 2600.00. 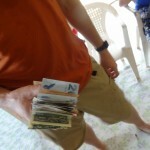 $1572.90 towards the pastor’s house project, and $1100 for the missions trip. 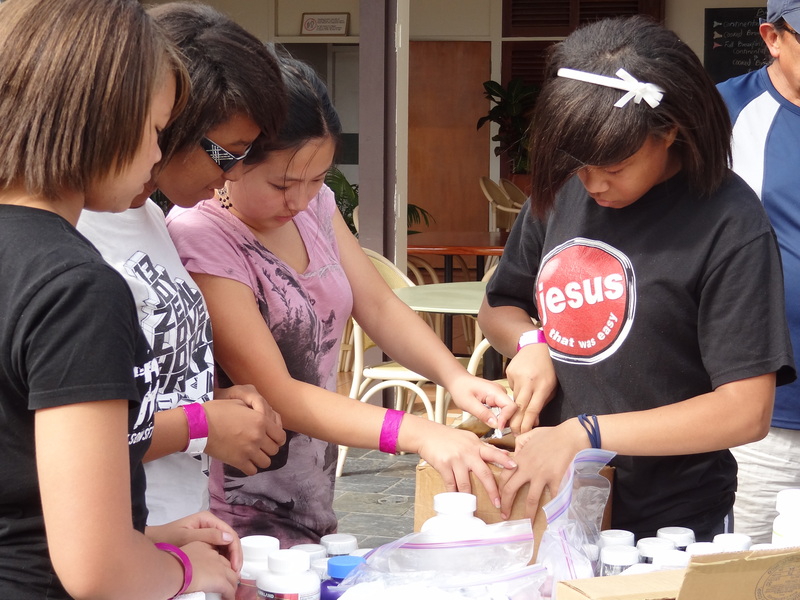 It was another incredible miracle to see a small group of kids give so much. Very humbling. 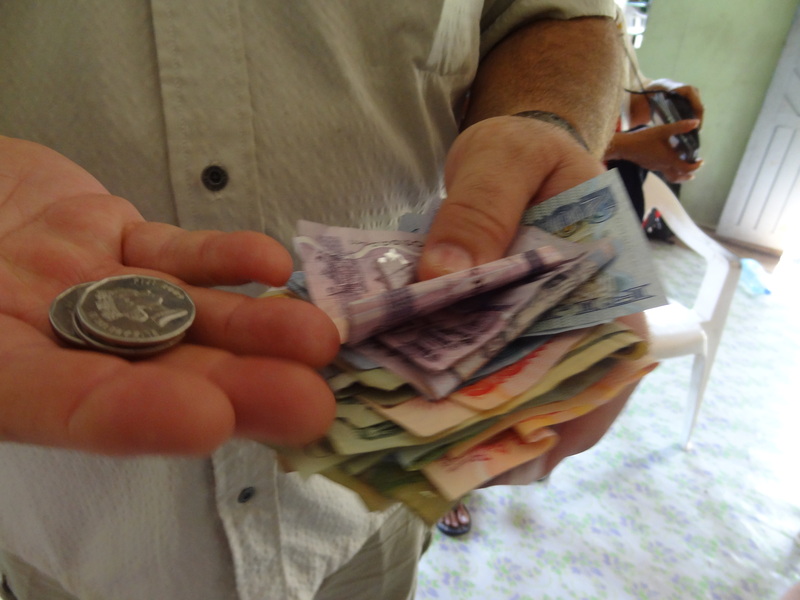 The money collectors reported students coming up, emptying out their entire wallets. It was a tearjerker moment. 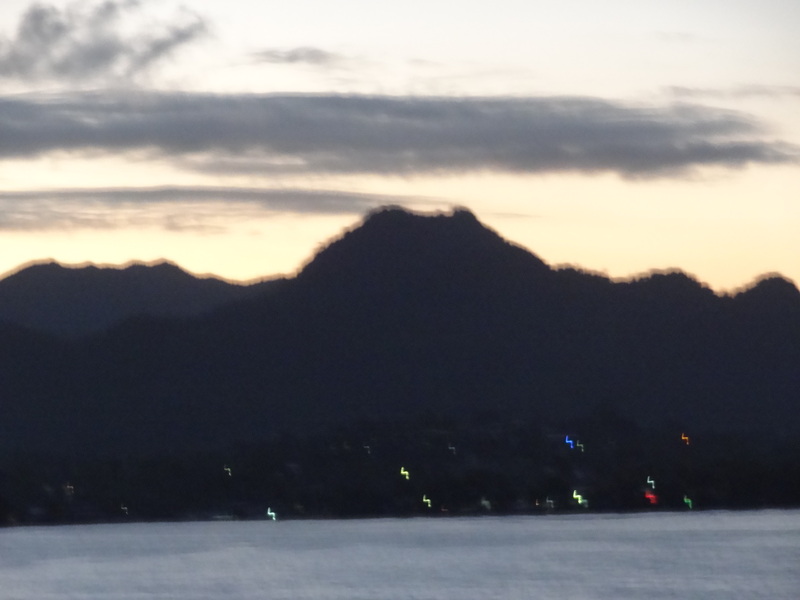 Then we loaded the ferry for 4 hours and were back in Suva. We stayed at the Sacred Cross Hotel, where I paid $5 for 30 minutes of internet time. I felt ripped off. We ate chinese food at a restaurant type food court, drank some fantastic Orange-Mango Schweppes, and went to bed. Sunday morning: We had an amazing church service with Pastor Steve Edwards preaching. We couldn’t get the ragman music to work, and I engineered a great idea to play it into headphones, then hold a microphone up to those. It was a missions moment, and a powerful drama. God spoke a bunch of things to me again, and I just cried and cried. It was a good time with God. 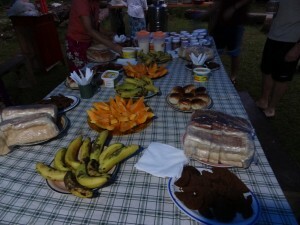 We ate a large proportion meal, and hit the bus to head back to Nadi. 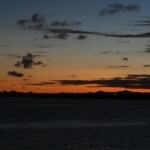 We had some amazing McDonald’s for diner, and arrived at the very luxurious Tanoa International Hotel. At this point, I thought my notes from the trip were over, but I found a few more pages. We’re at close to 6 thousand words, so if you want to finish the next section about testimonies, you can end there. The rest will be a short recap of our fun beach day, and shopping day before we came home. Student 1- Prayed with someone for salvation for the first time ever; Gave everything to God that she was holding back. Student 2- Seeing and talking with people, and how appreciative of us they were; God wants this student to go home, pray over a map, and see where she needs to go next. God also said not to be a profession the student was persuing. Student 3- The Schools were the best, and the kids faces and voices! God spoke and said to follow him, but in the USA. 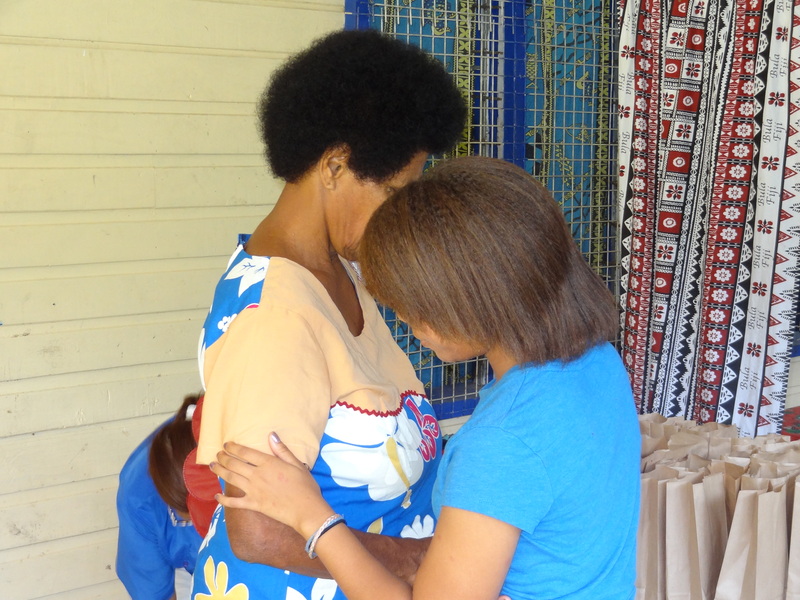 Student 4- Talking with people, having fun with the kids, answering all the Fijian people’s questions; Student wants to be different at home, and to let the Fiji experience change her. Student 5- Praying for a paralyzed woman, seeing how happy she was to be prayed for; also wants to go back home changed and different from the experience. Student 6- The 1st school, and how excited they were to see the team and hearing their laughter and smiles; God awakened evangelism in this student when she gets home, and knows a person who needs to be told about Jesus when school restarts. Leader 1- Praying with a woman who had lost her husband, spending time with her and talking to her; God moment was when Pastor Bill prayed. Monday we went to Beachcomber Fiji. 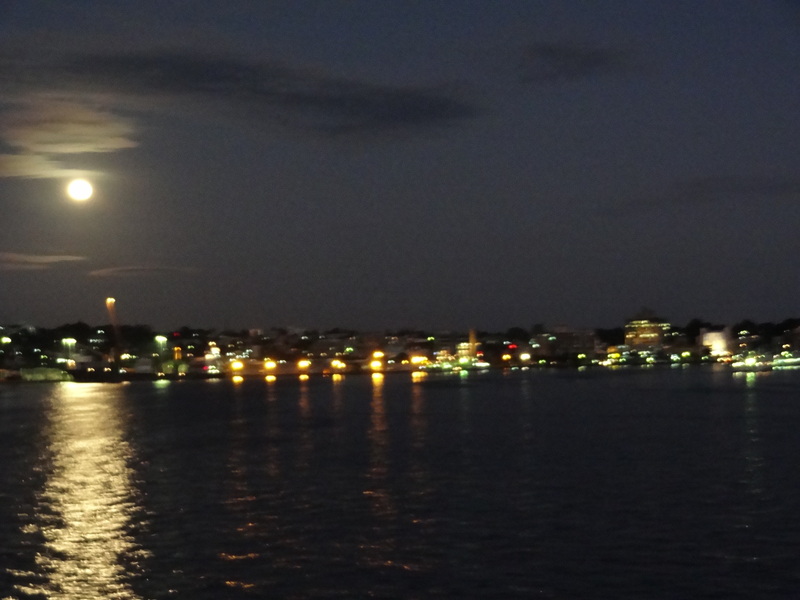 45 minute bus ride, 45 minute boat ride. Amazingly beautiful. I frolicked into the ocean, and cut my foot on coral, swam out to a buoy that was far away until I realized there are sharks in the water and my foot was bleeding… Went on a snorkel trip, and went mini-golfing. We ended the day with a team dinner. Many of the adults from other teams came to me and expressed how great our students did, and how proud they were. It was my best moment of the trip. We worked hard, prayed hard, and prepared hard and it all paid off. It was especially great for me to hear other people brag on our students. One parent expressed to me that our students were perfect role models for her kids who were on the trip. Good job students! Late Monday night, I had some great conversations with a few students. God was really working on their hearts and moving in their lives. We didn’t just go to minster to others, we came to be ministered to as well and God was opening up some old wounds in students that had tried to hide their issues. God is good. Tuesday, we came home. It just took a 44 hour Tuesday to make it. We had breakfast, we went shopping (the local market made a killing on inflated prices and the terrible bargaining skills of our teens), and we sat around the hotel and waited to head to the airport. Long story short, we made it home. Thanks to the students who came from CCC, you did an incredible job and impacted eternity. To GPM who made this the easiest trip to plan, and prepare for; and also the staff and leaders who were phenomenal. 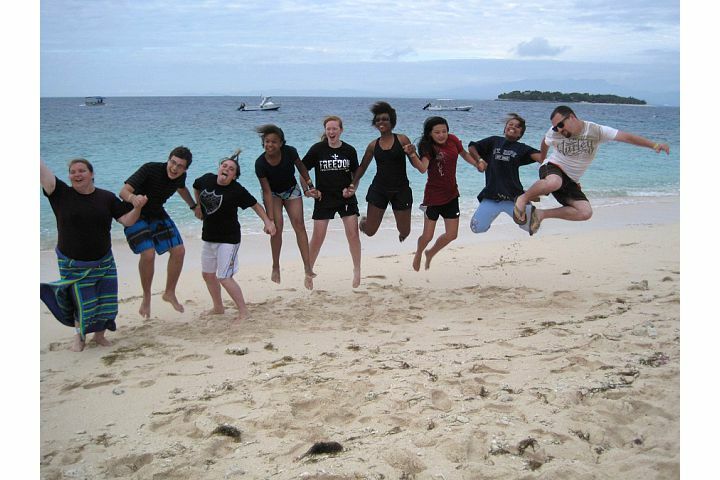 To the Hillside group who we didn’t have drama and got along great with and enjoyed doing ministry alongside. To MMI, who made it possible for us to serve and help in a practical way. 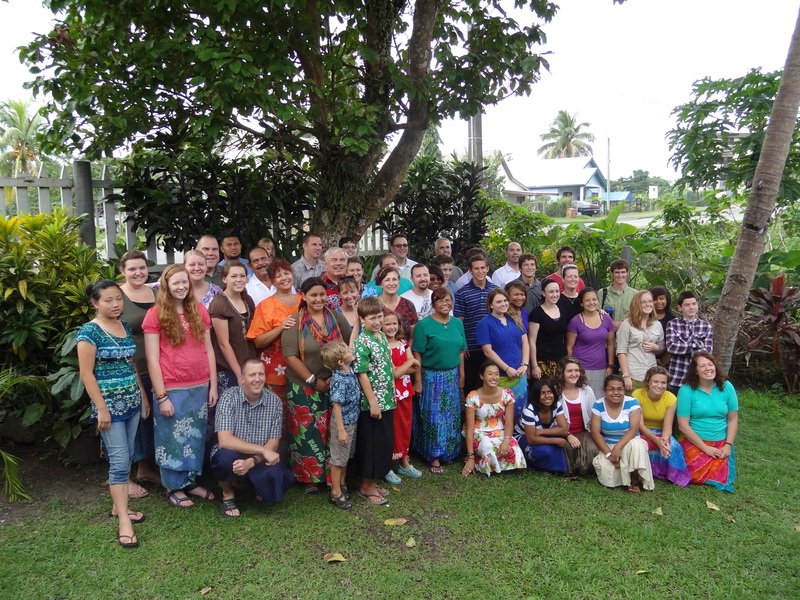 And to everyone else, pastors, trip attenders, missionaries, locals, interns who made the trip possible. It was life changing, and I cannot wait to one day be on the mission-field. I may try and edit this one day, but it’s been 3+ weeks home so I just want to get this published now. Please leave comments below, we’d love to hear from you. Great job Pastor Sean! I’ve seen such joy in the students faces and yours since the return. I’m so proud of all of you, what a wonderful opportunity you had. God is good! PS Thanks for the blog!